One thing kept us from leaving. I didn’t shoot this with a fish-eye lens. That mess — their fire, their tent, their pile of bikes — all literally 5 feet from my seat at my campfire. Photo Credit: Me and my iPhone. 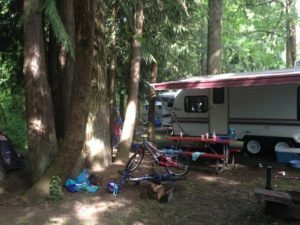 Shouting after a running pre-teen clearly ignoring me for what felt like the fiftieth time, I felt like our camping trip was ruined. These neighbor kids, pressing in on us, seemed in control of our situation. When we got up. When it was quiet enough to go to sleep. When our kids wanted to eat, or play. When we could sit peacefully around our fire. I could have it out with the thoughtless parents on either side. I could pack up our campsite and head out in defeat. We knew other places, private places, where we could go. I could sit in my camp chair and stare at the fire fighting back my bitterness. All of those thoughts crossed my mind. OK, they did more than cross my mind; they did a circle dance that lasted for hours. In the end we stayed. And we had fun. I had fun. The neighbors didn’t leave or quiet down. What made the difference? Taken from exactly the same location as the first picture, just looking in a different perspective. Photo Credit: Me, my camp chair, and my iPhone. What is perspective? Mostly we use its abstract definition: The state of one’s ideas. As an artist it has a more concrete meaning for me. Perspective is the view you have. 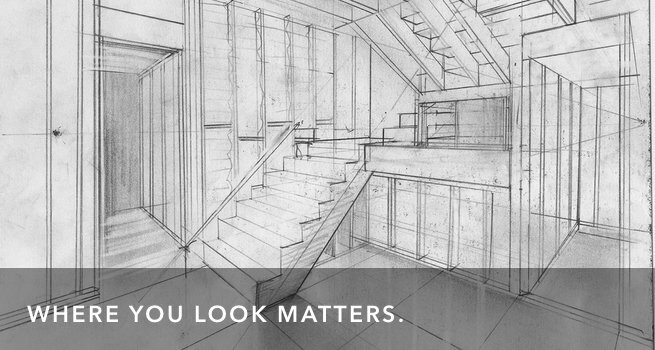 When you’re learning to draw, perspective is the tool you use to create the illusion of depth in your image. There’s a vanishing point, a horizon, lines that lead to the vanishing point. All of this creates a place for you to look in the drawing. From this angle, perspective is about where you look. Standing in my campsite I had a choice of where to look. Look to my left and there was our neighbor’s picnic table, fire pit, and pile of bikes, and a view directly into their RV. Five feet away from our fire! Look to my right, and there was grandpa’s canopy and the noise of cooking, a big dog, and the path that this whole family took crossing back and forth at all hours. Both of these views, honestly, led me to a place of bitterness. I was out here for peace and quiet, for goodness sake. But there was one other view. This is the view I set my camp chair in front of. 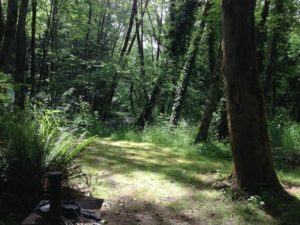 I could look across my campfire, through the breaking sunlight in the canopy of trees, across a stream and into beautiful green woods. What is perspective in this situation? 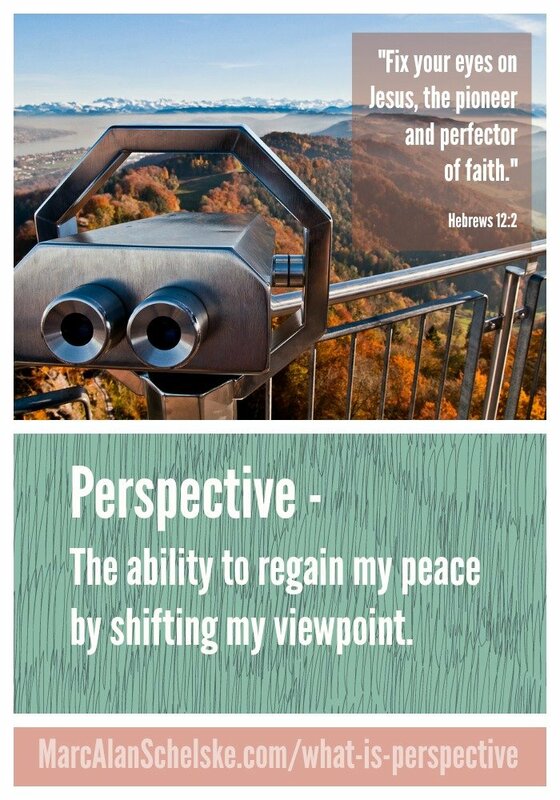 The ability to regain my peace by shifting my viewpoint. You’re eyes aren’t broken. They just tend to wander to the thing you’re most aware of. Too often you’re most aware of your irritations, your obstacles, the things you wish were different. One of the markers of a maturing spiritual life is the ability to choose your perspective. Facts are facts. We are going to be faced by circumstances that are out of our control. Sometimes irritating, like our less-than-ideal camping trip. Sometimes worse, even painful. When we cannot control the circumstances, there is always one thing left we can control. Where and how we look. Our perspective. Fixing our eyes, taking charge of our perspective. Choosing where we look and what we focus on. My circumstances hadn’t changed much at all. Noisy neighbors still crowded in. This camping trip didn’t measure up to my hopes. But when I planted my chair, and fixed my eyes in that one direction, I could change my whole mental space. An intentional change in my perspective changed my experience. You are facing cirucmstances that are not what you hoped for. You may have done everything you can about it. But you always have this one thing left. Where are you choosing to look? You could look at the aspects of the circumstance that are helping you grow. You could pay attention to the new opportunities the unexpected circumstance create for you. You could set your eyes on the one part of your context that is beautiful. You could choose to focus on Jesus. He is present with you. He has walked a road as hard as yours. Even He faced circumstances that were outside of His human control. That means you are not alone. You are understood. And you have a connection to the One who brings new life in dark places. Or, I guess, you could miss all of that by choosing to set your eyes on everything that’s irritating you. Reflect on the current struggle or obstacle in your life that is giving you the most grief. Note where your eyes are focused in the situation. What are you looking at and why? How is that persepctive helping you in the situation. Now, re-frame the whole struggle. Where else could you focus your attention? How could you focus on Jesus and His work in your life in this circumstance? How might fixing your eyes in this way alter your experience? Why does our perspective on a situation make such a big difference for us?